Star formations. 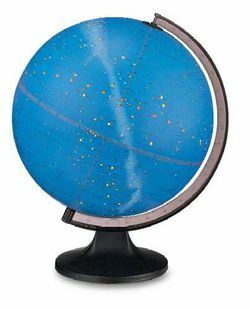 This unusual two-way illuminated 12" diameter globe will provoke many conversations in your home or office. Turn the light off and brilliant lithography delineates the firmament’s stars, constellations and nebula. Turn the light on and witness the luminous beauty of approximately 70 celestial images. Features a molded black base and smoke semi-meridian. Click on the image to see how it changes when illuminated!